I have always enjoyed handguns. They are so difficult to use effectively that the challenge has been fascinating. Like most young men, I started off with a .22, later graduating to larger calibers. During the White Systems/WhiteRifles years, I designed several muzzleloading hunting handguns, used them myself on some big critters, but none of them ever came into production. In the early days, that is, the 1950’s. we always had a handgun in the truck and usually a rifle in the back window, too. Later , I carried one constantly in the Alaska outdoors and nowadays, have one close to me at all times. BOBCAT- A smaller muzzleloading hunting handgun, the size of a TC Contender with an 8 inch barrel in 504 caliber. I only ever made one, but found it very useful and effective. I usually used 80 gr PyrodexP and a 440 or 460 grain PowerPunch bullet. It kicked about like a 44 Magnum, maybe a bit more. I killed a big Nilgai with it, for that advanture see ‘Nigai with a Bobcat’ under “Books and Articles’ at the top of the page. The action is a cut down White Lightning with safety on the right. Here’s a bad photo of me with the Bobcat pistol and the Nilgai. JAVELINA- There was a small production run of the Javelina to test the market. We found no great market at all and the gun never came into full production. The gun was meant to be used two handed with the sling around the back and the two hands bracing it against the pull of the sling. It worked quite well. I killed all sorts of pigs and feral sheep with this model, using rifle size loads and bullets. The recoil was surprisingly tolerable with the sling used properly. The Javelina had a 10-14″ barrel, almost always 504 caliber, weighed about 4 lbs. All the prototype stocks were wood, often painted black like the one pictured here. In reality, it’s a cut down Whitetail with two handed stock. RAZORBACK- There is only one of these. It’s a big pistol, modeled on the Javelina but with a folding buttstock so you can use it as a rifle too. The design makes it nice to travel with since it will fit in a suitcase. 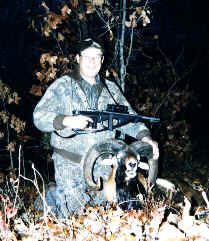 Doc and a beautiful mouflon, with the RazorBack in pistol configuration- stock folded forward. I’ve killed quite a few big animals with it over the years. It uses the biggest rifle loads. The sling is used just like the one on the Javelina, even when using it as a rifle. The sling makes it very stable.